Basement wall cracks create water problems. April showers bring May basement wall problems. Tax day has come and gone but the spring rains continue creating high water tables and hydrostatic pressure on our basement walls. This water exerts pressure on our basement walls causing cracks, bowed walls, and structurally unsafe conditions. While the first step is always to manage the water, the second step is now our concern. This step is to restore the basement wall to a structurally sound state in a cost effective manner using engineered products designed for this situation and installed by foundation repair professionals. The use of wall anchors can be used many times instead of the costly alternative of removing and replacing foundation walls. The process is a relatively simple process for a quality foundation repair expert. 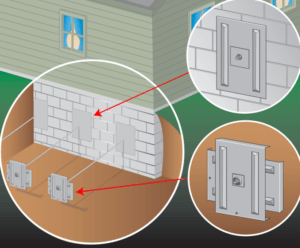 The following are the steps that foundation repair expert follow when installing wall anchors. So if your home has bowing or leaning basement walls contact a foundation repair expert to help you solve your problems today. We'll help find a contractor near you.